« L is for Love! Catching Stardust is FREE 4/15-4/19!!! 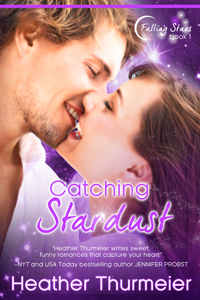 CATCHING STARDUST, the first book in my new Falling Stars series, is FREE this week Monday 4/15 thru Friday 4/19 ONLY! If you haven’t read it yet, now’s your chance to grab a copy and see what you think! And after you read it, be sure to leave a review! CLICK HERE TO GET YOUR COPY FREE AT AMAZON! Maia’s been banished to Earth from her place among the stars as the eldest sister Pleiades… and all because Orion won’t stop chasing her around the universe. Now Maia has to find her way back to the stars with only the help of hunky astronautics scientist Zander while staying hidden from Orion. Zander never expected the discovery of his lifetime to fall into his lap, but when Maia also falls into his bed, he knows there’s no way his can turn the goddess who’s stolen his heart into a science project. With his best friend ready to sell him out for fame, her wannabe lover Orion chasing after her on Earth, and time running out fast, Zander must fight to keep Maia safe long enough to get her home. If going home means losing Zander, is Maia ready to go back to the stars? What an interesting book! Thanks for the free copy.